Watches are designed based on caliber with manual winding FM-2025T. Frequency oscillations of the balance of 21 600 pc / h (3 Hz), range – 60 hours. The mechanism is based on an innovative system of descent with a fixed anchor wheel and inverted anchor. 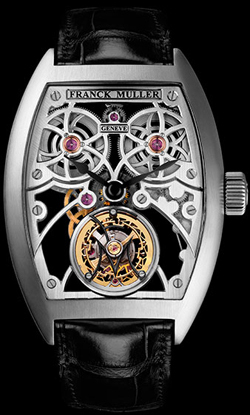 Franck Muller engineers took three years to develop this masterpiece. Technical perfection hours emphasizes well-defined contours skeletonirovannogo dial, which can be seen through a great finish mechanism. Novelty is presented in the body of 18-karat white gold, size: 55.05 mm x 40,65 mm x 13,70 mm. Offered on a black leather strap with a buckle in white gold.